Shasta Damboree Youth Leadership helped hide over 3,000 easter eggs at Clair Engle Park with the Lions Club Easter morning. They also helped in supervising the children so no one was injured and passed out candy to children who didn't find as many eggs as others. 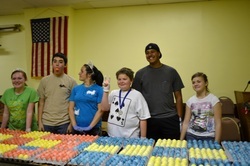 On Friday, April 22nd the Shasta Damboree Youth Leadership assisted the Lions Club in dying easter eggs for their annual Easter Egg Hunt on Sunday, April 24th.